Debyani grew up in a family in which education was incredibly important. Her goal initially was to become a doctor but some wise words from her grandmother gave her pause for thought. Her grandmother said to her that ‚Äúif you‚Äôre going to do research, do it so that you can help those who are suffering.‚Äù Debyani decided to get her doctorate in biochemistry and molecular biology. 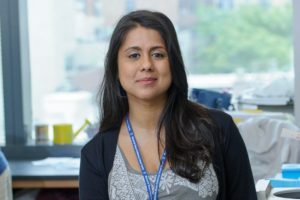 Debyani is now a cancer biologist at Memorial Sloan Kettering where her role involves her finding the irregularities in human DNA which causes cancer and then propose the drug that can target the cause. Only when there are more women of diverse backgrounds in the leadership positions in STEM fields, can accessibility to life-changing treatments be equally available to all. Currently scientists from under-represented demographics are key players in advocating for their populations, and only when there is equal representation can we hope to achieve universally available and accessible health care.